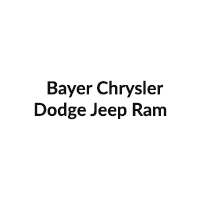 Bayer Chrysler Dodge Jeep Ram features the latest manufacturer offers and incentives on all new Chrysler, Dodge, Jeep, and RAM vehicles. Discover which offers are best for you and drive off in a new car today. Beyond great new vehicles, Bayer Chrysler Dodge Jeep Ram also stocks many used cars as well. Whether you’re in the market for a inexpensive used car or a certified used car that looks and drives like new, Bayer Chrysler Dodge Jeep Ram is your place to find it. Our Hamilton lot is filled with high quality, low mileage cars, trucks, vans, and SUVS. Bayer Chrysler Dodge Jeep Ram offers other services to Hamilton, as well. These include on-site car financing and auto repair. Call or visit us today and have all of your automotive needs met. Ask your Gatesville, Lampasas or Stephenville friends and neighbors and they will tell you, Bayer Chrysler Dodge Jeep Ram is the friendly Chrysler Dodge Jeep RAM dealer for your next car buying experience.